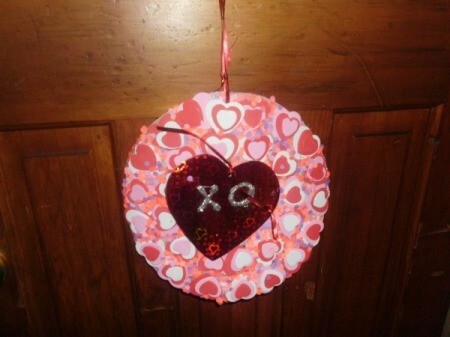 To make this heart wreath, we traced a large circle then a smaller one on the inside of a pizza box. We glued foam hearts onto the wreath, one on top of the other in 3 different sizes. We used a hole punch to cut out confetti in all different colors to fill in the spaces. We used glitter on a red heart in the middle of wreath that said "XO" and tied it inside the hole of the wreath with a ribbon. Using a hole punch, we made a hole at the top with a ribbon for hanging. This kept the kids busy for 2 hours.